Produced in Uni Mail, March 2010. 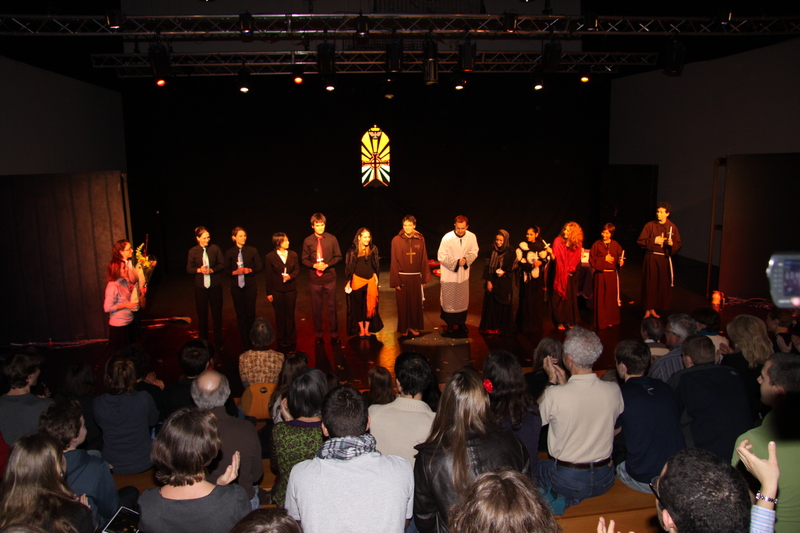 Cast: Sophie Badoux, Aurelia Clavien, Géraldine Donaldson, Eleanor d’Ersu, Tania Gentet Ganose, Rukkmini Ghosh, Aline Ijsselmuiden, Marisa Jotikasthira, Evren Kiefer, Kristijan Marinkovic, Dimitri Monnin-Gillot, Nicholas Weeks. This year we have been working on T.S. Eliot’s Murder in the Cathedral. The originality of this play lies in the combination of rich poetical language and a powerfully ritualistic form. We have tried to bring to life this political and religious intrigue from the 12th century by exploring all possibilities of work on movement, space and mime.